Table salt (sodium chloride) has only 2 or 3 chemical elements, whereas sea water has 84 elements; for our body to be healthy we need all those elements; in using common salt, we are depriving ourselves of vital trace minerals, contributing to health imbalances and becoming more susceptible to disease. If we think of our bodies having the same salinity as the ocean, and if indeed we all came from that original source of life on Earth, it would make sense to recreate in ourselves the perfect balance of minerals found only in these ancient bodies of water. 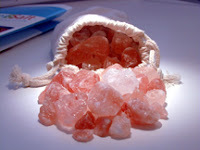 Find more info about Himalayan crystal salt, Ayurvedic tastes, tissue salts, and French natural sea salts. you are on a roll, i always love reading your posts and apparently i haven't been checking back regularly enough.